Hi! 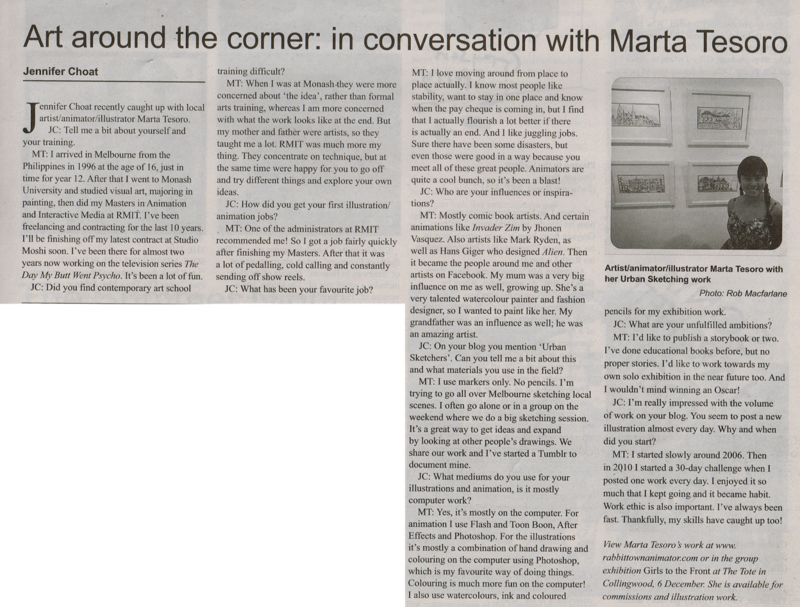 So a couple of weeks ago I got interviewed for this paper by Jennifer Choat. She found me on one of the websites I was affiliated with, though she wasn't quite sure how she got there, but hey, lucky right? Anyway, it was a one hour interview and Jennifer was very nice and professional. It's nice to have a blog to put up all stuff and be a digital scrapbook. Though every post I randomly read from the past just has me saying am busy. I've been busy for a very long time...which is great! can't believe that it will be my 11th year in the animation industry next year. Scary stuff, huh? For other news, I started at a new studio today and working on a project that am not quite sure am allowed to talk about just yet. More news when am allowed to tell them! However, on top of that job, a company that I have been doing a job for every Christmas, since 2012, has contacted me to do another video for their conference which I need to work on over Christmas and it looks like the whole of January has been booked too. I have two clients who are "Maybe" at the moment trying to book that month. I am not particularly worried since I have another 4 e-books to illustrate. Madness all around I tell you! Madness!!! Anyway, am still working on that freelance gig I've been working on since last week and I need to get a big chunk of it done tonight!